New Orleans Pelicans player Bryce Dejean-Jones was shot to death early morning in Dallas early Saturday morning. "An individual who believed to be breaking into the apartment of an estranged acquintance inadvertently broke into the wrong apartment," Joshua Pool, a manager at the Camden Belmont located northeast of downtown Dallas, wrote in an email obtained by USA TODAY Sports. "After breaking in, the intruder was shot and later taken via ambulance to a local hospital. Fortunately, no residents were injured." According to the report, at about 3:20 a.m Dejean-Jones had kicked open the front door and entered his apartment, according to a statement released on the Dallas police website. The resident said he heard Dejean-Jones enter and retrieved a handgun and shot Dejean-Jones. The Pelicans released a statement Saturday afternoon. 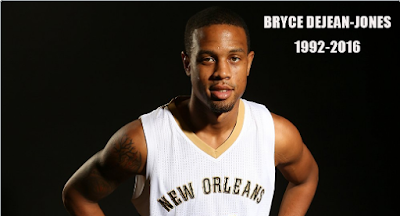 "It is with deep sadness that the Pelicans organization acknowledges the sudden passing of Bryce Dejean-Jones. We are devastated at the loss of this young man's life who had such a promising future ahead of him. Our thought and prayers are with Bryce's family during difficult time." Jones who went undrafted but signed a three-year deal with the Pelicans in February, the 23-year-old played for three different schools in college before finishing at lowa State.